Asthma (or Asthma bronchiale) is a disease that hurts the airways inside the lungs. It causes the tissue inside the airways to swell. Asthma also causes the bands of muscle around the airways to become narrow. This makes it hard for enough air to pass through and for the person to breathe normally. Asthma also causes mucus-making cells inside the airways to make more mucous than normal. This blocks the airways, which are already very narrow during an asthma attack, and makes it even more difficult to breathe. A person having an asthma attack often makes wheezing sounds when trying to breathe. This is the sound of air trying to pass through the very narrow airway. They also have shortness of breath, which means they cannot take a full deep breath. Chest tightness may happen which feels like their chest is being squeezed. They may also cough a lot. Asthma attacks can be a medical emergency because they can be fatal (cause a person to die). There is no cure for asthma. There are treatments such as different kinds of medicines to help people with asthma. There are also things that people with asthma can do to help themselves to keep their asthma from getting worse. There are a lot of risk factors for getting asthma. The exact reasons for each is not yet clearly understood. Some of the factors are believed to come from genetics. A person inherits genetic mutations from one or both of their parents that may increase the chances of developing asthma. Epigenetics, which are changes in the way a gene acts, may also increase their chances of getting asthma. These epigenetic changes may also be inherited. They may happen when a baby is still growing inside its mother, or during childhood. It is believed that a person gets asthma for different reasons, including the genes they get from their parents (genetics), changes in the way some of their genes work (epigenetics) and things in their life that are not healthy (unhealthy or negative environmental factors). Genetics: When changes happen in a person's genes (called mutations) these changes are passed on to their children. One or both parents may have these changes or mutations in their genes, and some or all of their children may be born with them, which means they inherited them. These mutations, once they happen, run in families from one generation to the next and are permanent mutations, they change the gene in the DNA. These changes can make a person more likely to get certain diseases like asthma. In some diseases it may be only one change in one gene that may make a person get that disease, in asthma it may be changes in many different genes that may make a person more likely to get asthma. Epigenetics changes or modifications cause different kind of changes that affect how a person's genes work or 'express themselves' in three different ways (called epigenetic mechanisms), but do not change the gene in the DNA. These epigenetic changes may be inherited, or they may happen in utero which is when a baby is still inside its mother. They may also happen in childhood, because of different reasons, like a respiratory infection, being exposed to chemicals or drugs, diet etc. These changes can be passed from one generation to the next but are not permanent and might only be passed down one or two generations. Even though epigenetic changes affect how a person's genes work they do not permanently change a person's genes. It is believed epigenetic changes may also make a person more likely to get certain diseases like asthma. Environmental factors are things that affect a person; which can be either healthy or unhealthy. Unhealthy environmental factors are things like living in an area where there is a lot of air pollution, or living somewhere where there are lots of bugs in the house, or being around cigarette smoke. If a person who has genetic or epigentic changes in their genes that makes them have a bigger chance of getting asthma (genetic predisposition), also has unhealthy environmental factors in their life, like living in a home that has a lot of dust mites, then it is more likely that they will get asthma. Atopy is when there are changes in some of the genes a person is born with (genetic inheritance). These genetic changes make their body produce more Immunoglobulin E (IgE), a type of antibody. They are also more sensitive to things things like chemicals, smoke and dust (environmental antigens). This hypersensitivity means they are more sensitive or allergic to things in the environment than people who do not have these changes in their genes and are not hypersensitive or allergic. This hypersensitivity causes their body to react in certain ways. Usually a person who is atopic develops allergic rhinitis which affects the nasal passages which are behind the nose and they are also more likely to get atopic dermatitis which causes skin rashes and atopic asthma. Up to 40% of people with allergic rhinitis also have asthma. These three medical problems, allergic rhinitis, atopic dermatitis and atopic asthma are called the Atopic Triad (a triad is when there is three of something). People who are atopic may also have other medical problems including food and drug allergies, stinging-insect hypersensitivity, hives (urticaria), Quincke's edema (angioedema), and contact dermatitis. If a person has one parent who is atopic they have a chance of being atopic too. If they have two parents who are atopic they have an even bigger chance of being atopic. There have been studies that show a link between acetaminophen (Tylenol) and asthma. For instance a 2008 analysis of information collected from a very large study called the International Study of Asthma and Allergies in Childhood, or the "Isaac study" for short, showed that children who had taken acetaminophen for a fever during the first year of their life had a 50% higher risk of getting asthma later on. The more acetaminophen children took the higher their risk of getting asthma. Children who took it once a month had threefold increase in their risk of getting asthma. An increase in asthma rates in multiple countries corresponded with increased sales of drugs which contained acetaminophen. Previously the American College of Physicians reported a link between non-atopic asthma and acetaminophen use based on results of The Third National Health and Nutrition Examination Survey. Not all doctors are convinced of the link between acetaminophen and asthma. "Children with asthma or at risk for asthma should avoid the use of acetaminophen." (McBride JT, 2011). This is a cross-section of the primary bronchi (one is bronchus, two are bronchi) which shows the inside of the airways. It is a posterior view which means looking from behind. Atopic asthma is the most common form of asthma. Cough-variant asthma is a type of asthma in which a cough is the main, and sometimes only sign. Cough-variant asthma usually does not cause wheezing or breathlessness and causes a dry, scratchy, mostly nonproductive cough (this means little or no phlegm is coughed up). About 30% of people who have cough-variant asthma will develop typical asthma. 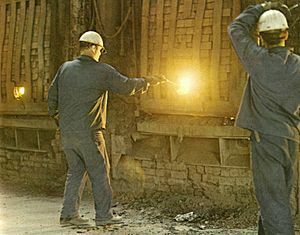 These workers are checking the furnace at a steel factory. The furnace gives off smoke, fumes and small particles. These are irritants and they can cause or trigger work-related asthma. 1. Occupational asthma with latency: this asthma type is when the signs and symptoms of asthma occur after a period of time (latency) after being exposed to the environmental irritants. e.g. : John starts working at a factory where chemicals are used the first week of January. At the end of March he starts developing the signs and symptoms of asthma. The period of time from when he started the job in January to when the signs and symptoms of asthma started in March is the latency period. 2. Irritant-Induced Asthma (IIA) is occupational asthma without latency: this is an asthma type is when the signs and symptoms of asthma can occur immediately (without latency) after being exposed to the environmental irritants. e.g. Frank starts a new job working as a janitor where he uses ammonia to clean. After opening the bottle of ammonia and breathing the fumes Frank starts finding it difficult to breath, his chest tightens up and he develops other signs and symptoms of asthma. 4. Work-aggravated asthma: this is when a person already has asthma and environmental triggers at their place of work makes it worse. Exercise induced asthma (EIA) - also called exercise induced bronchospasm - is the term used to describe asthma cases in which exercise is the main, and many times the only trigger for an asthma attack. 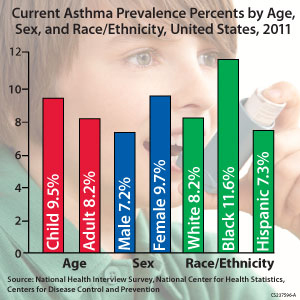 If a person already has a form of asthma or they are atopic there is more of a chance of getting EIA. Nocturnal asthma: is the term used to describe asthma cases that get worse at night (nocturnal). Premenstrual asthma (PMA): is when asthma symptoms get worse during the premenstrual period. This condition may affect up to 40% of female asthma sufferers. For a diagnosis of PMA to be made it is necessary to have a detailed history of the timing of menstrual cycles along with asthma symptoms experienced, and the peak expiratory flow rate (PMA may cause the PEF to be lowered in the premenstrual period). It is helpful in making a diagnosis to keep a diary of symptoms and peak expiratory flow (PEF) rates. Status asthmaticus is a severe form of asthma in which an asthma attack gets worse as it goes along and the medicines that are usually used to treat asthma do not work. Status asthmaticus can be fatal. 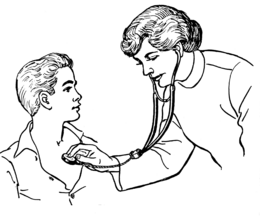 A doctor may use a stethoscope to listen for wheezing sounds in a person's lungs. Wheezing is a sign of asthma. Signs and symptoms in medicine are the way a medical condition affects a person's body. Sometimes the signs and symptoms of asthma may be mild which does not bother the person too much. At other times they may be severe which may make the person feel very sick. Not every person with asthma has all the signs and symptoms of asthma all the time. A person may have some signs and symptoms during one asthma attack and have different symptoms during another asthma attack. Some people with asthma may have long periods of time between asthma attacks where they show no signs and experience no symptoms of asthma, while others may have some or all of the signs and symptoms everyday which become more severe during an attack. It also depends on what type of asthma a person has and whether they have a mild, moderate or severe case. There are also some people with asthma who might only have signs and symptoms during certain times, such as those with exercise induced asthma, where the exercise triggers the symptoms. For some the signs and symptoms of asthma may be triggered or made worse (exacerbated) when they have viral respiratory tract infections, often the type casued by human rhinoviruses. Early warning signs of an asthma attack are physical changes in health that a person with asthma has before they have the attack. By knowing the early warning signs a person may be able to take steps to keep from having an asthma attack or if they do have one, to keep it from getting worse. Shortness of breath: this is when a person cannot take a deep breath which means they cannot fill their lungs all the way with air. They may be only able to take short, shallow breaths which does give their lungs enough air. When a person has shortness of breath they may also have chest tightness. These are some of the things that may make a person's asthma worse and can trigger an asthma attack. Tobacco smoke: a person does not need to smoke themselves, second-hand smoke can trigger an asthma attack. Second-hand smoke is the smoke from the end of a burning cigarette, cigar or pipe that someone else is smoking, or the smoke that they breathe out (exhale). Pets: animals give off chemicals called proteins which are allergens; people can be allergic to them. These allergens can act as irritants and make someone's asthma worse and trigger an asthma attack. The proteins are in the pet's dander which is the dead flakes of skin that animals (and people) shed. They are also in their urine, feces, saliva, and sebum which is made by glands in the skin called sebaceous glands. Sebum is what makes hair and skin oily. When dander, urine, feces, saliva, and sebum dry out their proteins can become airborne and breathed in. Some of the types of pets people can be allergic to are, dogs, cats, gerbils, hamsters, guinea pigs and pet birds. Bugs: different types of bugs which may be found inside homes may trigger asthma attacks. They may trigger asthma symptoms in the same way as pets; the proteins they give off are allergens and become airborne. Some of the more common bugs which may trigger asthma are dust mites, cockroaches and also bedbugs and fleas. Many other species that may infest a home may serve as a source of allegens such as Pharaoh ants. Fungus spores (mold): fungus reproduce by releasing spores into the air, if the spores land in a good place form them to grow then a new fungus starts. Breathing in these spores can trigger asthma. One of the most common types of fungus spores found in both outside and outside environments are from a group (genus) known as aspergillus. Strong emotions such as anger, stress and even laughter may worsen asthma symptoms. Outdoor air pollution can come from many sources such as car and truck fumes in areas of heavy traffic and chemicals in the air near factories and refineries. Weather: changes in the weather can trigger an asthma attack. Changes in air temperature can trigger an attack not just cold air. If a person goes from being outside in the cold into a warm house the sudden change can cause a broncospasm. Sudden changes in humidity also plays a part. The best way to deal with asthma triggers is to learn what they are and avoid them if possible, and if not totally avoidable then adjust one's behavior to deal with them. Example: running on a cold winter day right up to the doorstep of a warm house and going immediately inside; the sudden temperature change can cause an attack and could have been avoided. In general but especially with a medical condition such as asthma it is necessary to be aware of one's environment and what's in it, both indoors and outdoors. These are the tiny hairs called cilia, which line the inside of the airways. An asthma attack is when, after a period of time when aperson has had only a few or no symptoms of asthma, the asthma gets worse all of a sudden, usually because of being exposed to one or more triggers. When the asthma attack happens, the tissue inside the airways swell because of inflammation - which is how the body tries to protect itself from harmful things, like germs and irritants. When the tissues swell the opening (called the lumen) in the airway gets very narrow. The smooth muscles (which are the kind of muscles in the body that do not contract voluntarily, like the ones in the arm) around the bronchi and bronchioles begin to spasm or contract which makes the opening in the airway even narrower. This is called a bronchospasm. Inside the lining of the airways are glands called, submucosal glands, and above them, closer to the opening in the airway are cells called goblet cells - because they are shaped kind of like a goblet, which is a type of cup. The submucosal glands and the goblet cells make mucous which helps protect the inside of the airways. The mucous in the airways of healthy lungs is a thin film which traps irritants such as dust particles and pollen so they do not damage the airways and keep them from entering the air sacs (alveoli). There are tiny hairs lining the airway called cilia. 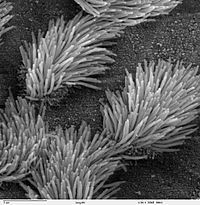 The cilia wave back and forth like a liitle whips, and help push the mucous and the trapped particles up the airways to the "pharynx. From there the mucous, the trapped particles from the lower airways can be coughed up (this is called sputum). During an asthma attack the submucosal glands and the goblet cells start making much more mucous than normal, and the mucous is also thicker than normal. This makes it very hard for the cilia to do their job, and bring the mucous up out of the airways. So now there is too much mucous being made, and not enough being brought up by the cilia. The airways are already to narrow to breathe properly because of the tissue swelling caused by inflammation and the constriction caused by the bronchospasms, so the extra mucous blocks the airway even more. This makes breathing very difficult. In fatal asthma attacks the airways can become so constricted and/or plugged with mucous that no air can get through at all. There are other signs of breathing difficulty as in an asthma attack, which are important to learn, and knowing them can help tell if someone who cannot talk is having breathing problems. People who may not be able to let somebody know they are having breathing problems include babies and young children. Intercostal retractions The skin between the ribs appears 'sucked in' as the intercostal muscles (located between the ribs) contract more than normal. This in an effort to help the body take in more air because of difficulty in breathing. Intercostal retractions are a sign of breathing difficulty and a possible sign of worsening asthma or an asthma attack. Chest and neck retractions; which cause muscles within the chest and neck not normally used too much when breathing, to begin contracting as they try and help to take in more air. Retractions are how the body tries to get enough air because of the difficulty in breathing normally because of the asthma attack. These retractions cause the skin of the chest wall, the skin of the neck and or the breastbone (sternum) to move in when breathing. There are different types of retractions which depend on which muscles start contracting, and this depends on how much difficulty a person is having breathing during an attack. Nasal flaring is when the opening of the nostrils get larger than normal during breathing. It is often a sign that a person is having difficulty in breathing. Blue lips and fingertips: oxygen which is in the air we breathe, is what makes blood have a red color. Blood without oxygen has a blue color. Oxygen enters the body through the air sacs (alveoli) which are at the end of the airways. During an asthma attack it difficult for the body to get enough oxygen because it is difficult to get enough air. 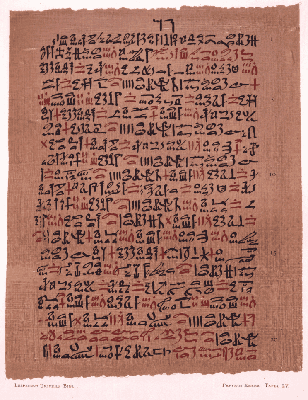 As less air with oxygen in it makes it to the air sacs and into the blood, there is less red blood (blood with oxygen in it) and more blue blood (blood without oxygen in it). The blue color of the lips and under the fingernails is because of the blue blood, which can be seen in the small blood vessels under the skin. More parts of the body start turning blue the longer the body goes without oxygen. When parts of the body turn blue because of lack of oxygen it is called cyanosis. Sweating : sweating may be noticed especially on the forehead, but the skin does not feel warm, it may feel cool and clammy to touch. Rapid breathing (tachypnea); breathing in and out much faster than normal. Rapid heart beat: (tachycardia): the heart starts beating much faster than normal. A child using a peak flow meter (PFM) which measures how well air moves out ( the peak expiratory flow, or "PEF") of a person's lungs when they breath out (exhale). Spirometry; measures how much air the lungs are able to breathe in and how much air they breathe out and how fast a person can exhale. Bronchoprovocation test; in this test the airways (bronchi and bronchioles) are provoked (to try and make something happen) into having a bronchospasm (make the airways constrict) this is to see how sensitive they are. Some of the things done to provoke a bronchospasm are making the person exercise, breathing cold air that gets colder, or breathing in a special chemical called methacholine. The results of bronchoprovocation are checked using spirometry. Goblet cell hyperplasia Airway remodeling may cause the body to make more mucous-making goblet cells than normal. More goblet cells than normal equals more mucous than normal. Airway remodeling is when there are permanent physical changes to the airways that also affects how they work. This may happen after chronic long-term asthma. After cycles of inflammation, damage and repair to the airways. permanent remodeling of the airways may occur. This is when the physical structure of the airway changes. This will cause permanent airway narrowing (they are always more narrow than normal and get narrower during an asthma attack), bronchospasms are more easily triggered (bronchial hyperresponsivenes), airway edema (fluid in the airway), and mucus hypersecretion (too much mucous is made) as well as the build-up of collagen around the airway which is called fibrosis. Airway remodeling has been observed in chldren as young as six. Not managing asthma properly can lead to airway remodeling and this can increase the risk of dying from an asthma attack. One of the main problems which cause poor asthma management is not using the asthma inhaler correctly. One of the main reasons for improper inhaler use is the asthma patient not having the proper knowledge in using the inhaler due to not receiving proper instruction. Goblet cell and submucosal gland hyperplasia: Among the physical changes that may happen in airway remodeling is goblet cell hyperplasia and submucosla gland hyperplasia. Submucosal glands and goblet cells make mucous which helps to protect the airways by trapping harmful particles like dust and pollen. The mucous is normally a thin film which lines the airways. The mucous and whatever particles they trap are brought up to the pharynx by tiny (microscopic) hairs on the inside of the airway that move back and forth called cilia. During an asthma attack the submucosal glands and goblet cells make too much mucous, and it is thicker than normal which makes it harder for the cilia to bring the mucous up. When airway remodeling happens the body may make many more submucosal glands and goblet cells than normal, which means even more mucous is made. There may be too much mucous for the cilia to bring up and the airway may become blocked. This is one of the reasons that people with airway remodeling often have more severe asthma. In fatal cases the airway may have become totally plugged causing asphyxia. A woman using a metered-dose asthma inhaler (or just inhaler for short), which has medicine to treat an asthma attack inside. When the inhaler is put in the mouth and pressed, the medicine is sprayed into the throat and then enters the lungs. An asthma action plan or management plan, is used to help a person with their asthma. It shows what kind of medicines to take, and when to take them. How to take care of their asthma everyday, AND how to take care of their asthma when it gets worse, or when they have an asthma attack. It helps them know when it is time to call the doctor or go to the emergency room. Asthma can be controlled most often by avoiding contact with triggers and by using certain drugs. Most asthma sufferers carry special medicines around with them. These are called inhalers. The medicine inside the inhaler opens the tubes that go to the lungs. The inhaler is usually used to prevent an asthma attack, or to stop an attack that is already happening. Rescue medicine — A rescue medicine is an inhaler ("puffer") that is used if a person thinks they are having an asthma attack. Controller medicine — A controller medicine is a medicine in either a pill or an inhaler taken every day to prevent asthma attacks. Certain drugs that can be given through an IV (intravenously). Non-steroidal anti-inflammatory drugs or 'NSAID' for short. Aspirin is a NSAID and some people are allergic to it, or may have a higher risk of becoming allergic to it, even if they had used it before. Beta blockers are a kind of drug used to treat heart problems, but should not be taken by people with asthma. Acetaminophen is another drug that is believed might help not only to cause asthma, but also make asthma worse in people who already have it. Acetaminophen is an analgesic, a pain reliever. Because of its pain-reliving properties, Acetaminophen is often added to other drugs. Labels should always be read when taking any kind of medicine, including over-the-counter drugs. ACE Inhibitors; are a type of drug usually used to treat high blood pressure and heart disease. They usually don’t make asthma worse, but in rare cases they may cause some of the signs and symptoms of asthma, such as airway obstruction and coughing, especially in the first few weeks of taking ACE Inhibitors. Sleeping pills and trainquilizers; should usually not be taken by people with asthma. These are some of the more common problems a person with asthma may also have. Often, having one medical problem makes it more likely a person will also have one or more other medical or psychiatric problems. These other disorders are the "comorbid problems" or "comorbidities". There are various comorbid medical and psychiatric conditions associated with asthma. Allergic bronchopulmonary aspergillosis (ABPA) is a disorder that affects the airways of the lungs which is caused by an allergic hypersensitivity to the fungus Aspergillus fumigatus. >10.1 7.6-10.0 5.1—7.5 2.5-5.0 0-2.5 no data: for these areas there was not enough information. It is more common in developed countries than developing countries. The United States and Canada have some of the highest asthma rates in the world even though they are not poor countries. In Africa the country of South Africa has the highest asthma rate on the whole continent even though it is one of the richest countries. More than 80% of the people who die from asthma are usually from low and middle income countries, but not always, as South Africa has the fourth highest death rate in the world even though it is one of the richer countries in the world. In the United States the death rates are higher for females, adults and people of African descent. As of 2011, 235–300 million people worldwide are affected by asthma, and approximately 250,000 people die per year from the disease. Rates vary between countries with prevalences between 1 and 18%. The amount of asthma cases reported each year has gotten much higher between the 1960s and 2008 Rates of asthma have plateaued in the developed world since the mid-1990s with recent increases primarily in the developing world. Asthma affects approximately 7% of the population of the United States and 5% of people in the United Kingdom. Canada, Australia and New Zealand have rates of about 14–15%. Fluticasone propionate metered dose inhaler commonly used for long-term control. Obstruction of the lumen of a bronchiole by mucoid exudate, goblet cell metaplasia, and epithelial basement membrane thickening in a person with asthma. Asthma Facts for Kids. Kiddle Encyclopedia.